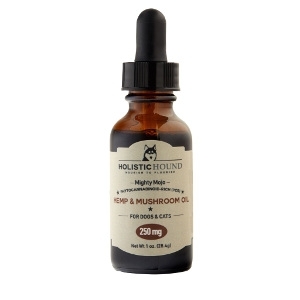 Holistic Hound’s newly reformulated Mighty Mojo Mushroom & PCR Hemp Oil now features water soluble phytocannabinoid-rich (PCR) hemp oil, significantly increasing bio-availability and ensuring very high absorption efficiency upon ingestion. The extract, which is appropriate for use with both dogs and cats, is made with full-spectrum PCR hemp oil, containing CBD and other beneficial constituents, and wild crafted Chaga mushroom extract. Our PCR hemp is organically grown and produced in Colorado using a solvent-free, super critical CO2 extraction method. Chaga mushrooms are harvested from birch trees in pristine woodland environments in the US, and are rich in beta glucans, triterpenes and antioxidants for additional health benefits. Each batch is THC-free and third-party tested for safety and potency. This oil provides powerful immune support with 250 mg of full spectrum PCR Hemp oil and 13.5 g of Chaga mushroom extract. Because our PCR hemp oil is non-intoxicating you can give more or less, as needed.